The Tessa Jowell Brain Cancer Research Mission covers several of Baroness Jowell’s campaign requests, and will include a boosted research fund, an annual global symposium and new commitments to clinical excellence in her name. This follows a meeting Tessa Jowell had with the Prime Minister and the Health Secretary in Downing Street in February. 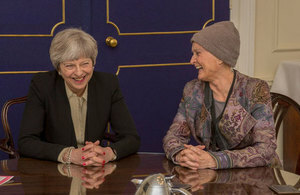 "Baroness Tessa Jowell faced her illness with dignity and courage - and it was a privilege to host her in Downing Street recently to discuss what more we can do to tackle brain cancer. We send our sincere condolences to her family - and I hope that the actions we are taking now and in the future to improve care and research for those confronting a terrible disease will form part of the lasting legacy of an inspirational woman." "Tessa Jowell was one of those few politicians who could inspire and unite across party lines. We were all moved by her bravery and selfless campaigning in her final months, and are determined to honour her life and memory with the action on brain cancer that she fought so hard for. At this agonising time, I hope her family can draw comfort from the fact that her legacy will be lives saved and heartbreak averted for thousands of other families." "We are deeply saddened by this loss – Tessa Jowell did more than anyone to shine a light on the need to improve research and care for people with brain cancer. "It is a great privilege and honour to take forward this work, which we hope will boost life-saving research and transform brain cancer care in the way that Tessa called for." The research fund will initially consist of £65 million, and we will aim to increase it each year as high quality research proposals that can boost outcomes for people diagnosed with brain cancer emerge. £40 million in Government funding will be bolstered by £25 million from Cancer Research UK, on top of the £13 million it spends each year on research and development of cancer treatments. This research will be backed by new clinical commitments – including a national rollout of one of the key brain cancer diagnosis tests, gold standard dye, which is used to identify tumours. This dye is currently only used in half of brain cancer centres in England. There is also a new commitment to accelerate the use of adaptive trials – to test different treatments at the same time and speed up the process. In addition, the UK Government will host a new Tessa Jowell global symposium, which will bring together the best clinical, scientific and academic minds on brain cancer, in order to identify gaps, best practice and priorities in research. Each year around 11,400 people in the UK are diagnosed with a brain tumour and just 14% of people survive their disease for 10 or more years. It is hoped the Tessa Jowell Brain Cancer Mission will stimulate innovative new research and clinical practice to boost outcomes of people diagnosed with brain tumours.